Day by day, the remaining light from the sun is fading, and the darkness growing. Stars have emerged by their hundreds, and we've had our first astronomical excitement of the long night: Iridium flares. Iridium is a constellation of low-orbit satellites designed to provide global satellite phone coverage. South Pole Station uses the Iridium network for email and phone communications during the 13 hours each day when the satellites used for internet connectivity aren't visible. 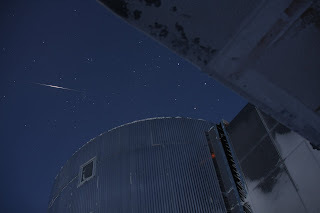 Occasionally through the year, a quirk in the shape of the Iridium satellites will catch the sunlight and reflect it down onto earth with blinding intensity. This reflection, brighter than anything else in the sky except the sun and moon, occurs all over the planet, but is generally rare. At the pole, however, the orbits all intersect, and every 9 minutes, a satellite will pass overhead. When things are properly aligned, the sky will light up, regularly and predictably, giving dozens of flares in a row. 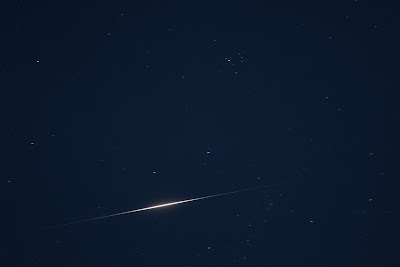 During a flare, the satellite passes dimly above, gradually growing into a brighter and brighter point of light, before bursting into a brilliant flash, then slowly fading away again. They're truly a beautiful sight, but a tricky experience to capture on film. By setting a sufficiently long exposure, though, a flare will turn into a wonderfully photogenic slash of light across the night sky. The Iridium flares last only a day or so before the satellites fade back to their usual dull passage. Thankfully, they will recur several times through the coming winter. The show this past weekend was only the opening act. unreal man, absolutely UNREAL... chat with ya soon. Your blog is so cool. Thanks for giving us the lens. 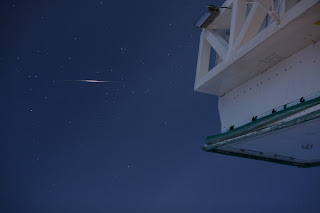 I wonder of Iridium Flares or similar phenomena are responsible for some "UFO" sightings.